By 1760 small copper coins were scarce in Ireland. Issues of both denominations were scheduled to be minted in 1760 but apparently they did not arrive in Ireland until 1762. It has been speculated this was partly due to the death of George II in October of 1760. Under these circumstances underweight Voce Populi farthings and halfpence first appeared in Dublin. 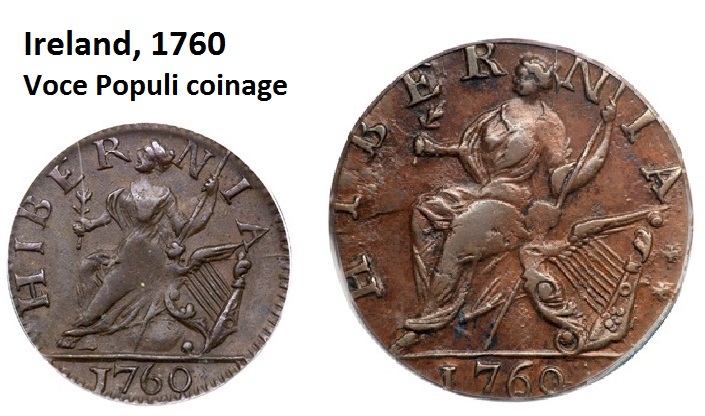 After the arrival of the new ‘regal’ coppers, it is thought that Dublin speculators bought the Voce Populi tokens in quantity and shipped them to America, where they circulated widely until the Revolutionary War. 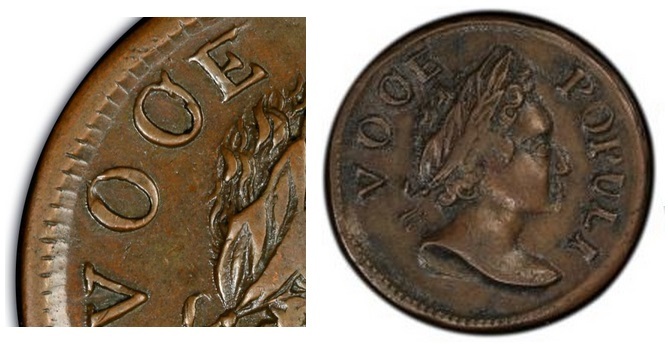 1760 Irish Voce Populi copper farthing – large lettering on obverse. This coin also circulated in the American Colonies, therefore US collectors also consider it an Early Colonial coin. Voce Populi farthings with small lettering are extremely rare and they do not appear very often at auctions. When they do, they tend to attract a lot of attention, i.e. frenetic bidding and high prices. 1760 Irish Voce Populi copper halfpenny. This coin also circulated in the American Colonies, therefore US collectors also consider it an Early Colonial coin. Or, perhaps it was some else ! Over time these issues were supplemented with regal George III Irish halfpence (produced in 1766, 1769, 1774-1776 and 1781-1782) and many lightweight counterfeit and imitation Irish copper coins. The obverse displays a male bust wearing a laurel wreath (personification of the people) with the motto Voce populi (By the voice of the people). The obverse shows the seated figure of Hibernia with a harp and the legend “Hibernia” above, the date in exergue. The now 17 different obverse design varieties suggest that there may have been more than one mint or individual producing these pieces, i.e. John Roche, Edward Barry, and “several copper smiths, tinkers and other persons” mentioned by Dublin’s Lord Mayor (John Tew) in his proclamation during August 1760. A specialist collector, with very deep pockets and a lot of patience … some of these types are exceedingly rare ! only six examples are known to exist ! 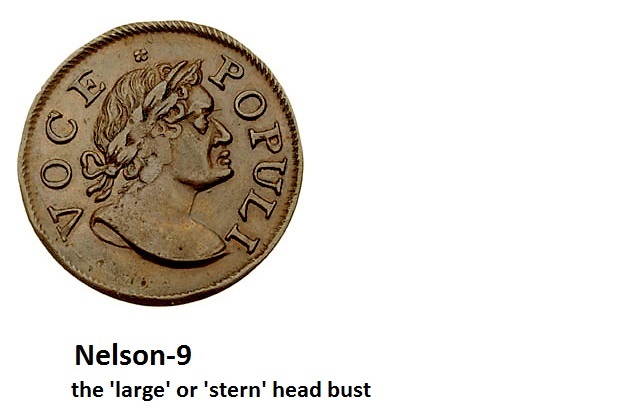 The recently discovered and unique Voce Populi halfpenny (Nelson-17) variety most closely resembles the Voce Populi variety identified as Nelson 4 and Zelinka 2-A. The established variety shares a reverse die with the new discovery, but the obverse on the new coin is from an entirely new die. John Kraljevich, an expert in Colonial numismatics who is author of the monthly Coin World column “Colonial America” and a numismatic consultant for Stack’s Bowers, cataloged the new variety for the auction. According to Kraljevich, the Nelson 17 variety most closely resembles the Voce Populi variety identified as Nelson 4 and Zelinka 2-A. The established variety shares a reverse die with the new discovery, but the obverse on the new coin is from an entirely new die, Kraljevich said. “The head punch is quite tall, like Nelson-4, but shows distinctive details: thinner and more pointed leaves in the laurel, an extra curlicue curl between the two hair ribbons and the back of the neck, a more Roman style nose and higher, more prominent lips,” according to Kraljevich’s auction lot description for the Nelson 17 variety. “The letter positions on the obverse are also distinctive, particularly notable at OP of POPULI, which is close together on Nelson-4 but shows a space between them on this new die. LI of POPULI are almost touching on Nelson-4 but show considerable space here. The tops of POPULI are also closer to the long denticles on this die than they are on Nelson-4. Although there is no numismatic evidence of them being ‘officially’ exported (in bulk) to the American Colonies, they do seem to have circulated there and many American collectors include them as part of their ‘colonial’ or ‘pre-Declaration’ (of Independence) numismatic heritage, i.e. both Irish and American collectors collect them. With avid collectors on both sides of the Atlantic, the consequent excess of demand over supply is what makes these coins so expensive. Who was John Roche ? In 1738 he did a medal of Dean Swift. This medal, which is cast and roughly executed, bears a medallion bust of the Dean supported by Hibernia with her shield and spear, a Gorgon shield lying near her, and by History who crowns the bust with a laurel wreath. Above is a winged figure with a crescent on her forehead, and near her an infant Genius with a palm branch. Below is a scroll inscribed REV. I. SWIFT. D.S.P.D. (the Reverend Jonathan Swift, Dean of St. Patrick’s, Dublin). On reverse is Hibernia seated, leaning upon a harp and holding an olive branch; ships, flocks and herds appear in the distance. On exergue, MDCCXXXVIII, and the artist’s initials I. R. FECIT (see “Medallic Illustrations” published by the British Museum, Vol. II, p. 525). The head of Swift is copied from the portrait engraved by P. Simms (q.v.) in Swift’s “Works,” published in 1734. Roche also issued a medal commemorating the taking of Portobello by Admiral Vernon, signed I. R. Dublin. It is an imitation of one of Pinchbeck’s. One of the medals commemorating the Convention of El Pardo in 1739, by which Spain agreed to compensate British merchants and shipowners, signed J. R. is probably his. Roche in 1741 applied to the Dublin Society for its encouragement and help in the making of “Birmingham ware” which he had introduced into Ireland. In an advertisement issued by him from the Golden Heart in March, 1747, he describes himself as the “only person in this Kingdom who makes all sorts of gilt, silver and plated coat buttons for gentlemen’s wear, metal buttons for livery, gilt and metal sleeve-buttons, iron, steel and metal shoe-buckles and other kinds of hardware” (“Faulkner’s Journal,” 28th February, 3rd March, 1746-7). In the same year he petitioned the Irish Parliament, praying for encouragement in the manufacture of hardware; and in 1759, in response to a further appeal to the Dublin Society for help in carrying on his manufacture of Birmingham ware, the Society lent him one hundred pounds. In 1760 there was such a scarcity of copper money in Ireland that, to meet the want of small change, a quantity of base coin was manufactured and put into circulation in Dublin. This gave an opportunity to Roche to issue copper half-pence and farthings which, being of good metal, were generally received in preference to the wretched stuff then in circulation. This coinage consisted of a series of half-pence and farthings which, from the inscription upon them, are known as the “Voce Populi” coinage. On the 29th August, 1760, the Lord Mayor, John Tew, issued a proclamation stating that being informed “that several copper smiths, tinkers and other persons have been and are now engaged in different parts of the city and the suburbs thereof in forming of base metal into an imitation of the copper half-pence current through this Kingdom,” a reward would be given for bringing the offenders to justice. One Edward Barry was committed to Newgate, and in November was sentenced to stand twice in the pillory with a paper denoting his crime fixed on his breast and back. Roche’s apparatus for striking his coins was seized, but further proceedings against him were stayed by his death, which occurred in his house in King Street on 24th September, 1760. Yet another set of tokens I’ve never come across before. Absolutely fascinating stuff ! If a collector wanted a half reasonable example of one of the commonest examples from this series what would it currently cost them? So in the great scheme of things even the commoner examples come with a high price tag! None of these coins are ‘common’ insofar as I have only found a dozen or so over the past 40 years of going through old attic clearances and accumulations. Thank you for such a thorough article about these Irish tokens. Details that you discuss here were not available for us collectors back in the 1970s. Prices for the Voce Populi tokens have escalated at a remarkable rate since then. Alas, I sold my entire Voce Populis decades ago to Richard Picker of New York. Regards, Jerry Zelinka.